Apple may have finished dazzling us with new products this year, but a new leak from a French website may provide a glimpse into what the company may be up to in 2013. CNET reported Wednesday that images of a purported next-generation iPhone have surfaced on French website Nowhereelse.fr, revealing an exterior virtually identical to the current iPhone 5. The leaked handset has already been referred to as the "iPhone 5S," in keeping with Apple's naming convention for updates to the outward appearance of its iconic device. Thus far, Apple has used the "S" appendix twice: First with the iPhone 3GS in 2009, then again two years later with the iPhone 4S, each modest updates from their respective iPhone 3G and iPhone 4 predecessors. In keeping with its bi-annual tradition, the presumed iPhone 5S prototype reveals slightly different placement for internal screws, but otherwise minor tweaks from the current version. 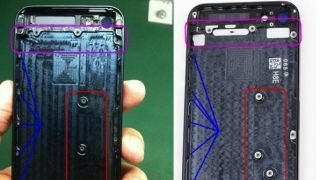 The casing of the handset also appears identical to the iPhone 5 - with specific information branded on the back has been replaced with an X - which could indicate the leak comes from a prototype under development.